The Winnipeg Jets begin a three-game road trip through the Atlantic Division tonight against the Montreal Canadiens…The Jets lost 3-2 to the San Jose Sharks in overtime on Tuesday, but still went 2-0-1 during a three-game homestand…Winnipeg continues the road trip on Saturday afternoon against the Ottawa Senators. The Jets are 14-10-0 on the road this season…Winnipeg went 2-4 on the road in January, but are 10-5-0 in their past 15 games away from Bell MTS Place…Winnipeg hasn’t lost three consecutive road games in regulation since Dec. 10-20/16…The Jets are two-for-five on the power play in their past two road games….Blake Wheeler leads the Jets in scoring on the road this season with 24 points (3G, 21A) in 24 games, while Patrik Laine has a team-leading 16 goals in 24 games. The Jets are in a stretch of 11 games (3-1-1) in 20 days…Winnipeg went 6-3-0 in nine games in 16 days leading into the break…The Jets are in the midst of playing their last 34 games of the regular season in 69 days. The Jets are 13-6-1 against Eastern Conference teams this season, including 5-3-1 against the Atlantic Division…Winnipeg is in a stretch of seven of nine games against Eastern Conference teams…Winnipeg went 19-7-6 against the Eastern Conference last season, including a 10-3-3 record versus the Atlantic Division and 9-4-3 record against the Metropolitan Division…Blake Wheeler leads the Jets with 25 points (2G, 23A) in 19 games against the Eastern Conference, while Mark Scheifele has 23 points (12G, 11A) in 19 games. Winnipeg has scored four goals or more in 10 consecutive victories and in 16 of their past 17 wins…The Jets are averaging 4.6 goals per game in wins this season, which is the second most in the NHL…Meanwhile, the Jets have been limited to two goals or less in nine consecutive losses and have been outscored 29-10 in those games…Of the 53 games the Jets have played this season, 32 have been decided by two goals or more. Defenceman Jacob Trouba notched his 25th assist of the season on Tuesday to match a career high for assists in a season (2016-17)…He has an assist in three consecutive games (5A) and 13 assists in 15 games since Dec. 31/18…Trouba sits tied for fourth in NHL scoring among defencemen since Dec. 31 with 14 points…He played a career high 7:48 on the power play on Tuesday. Adam Lowry has won 50% or more of his faceoffs in four of his five games since the all-star break (35-for-59, 59.3%)…He won 8-of-10 faceoffs against the Sharks on Tuesday, marking the third time this season he took at least 10 faceoffs in a game and lost three or less…Lowry is sixth in the NHL this season with a 57.0% faceoff winning percentage. The NHL named Jets forward Jack Roslovic the league’s first star of the week on Monday…Roslovic opened the week with a goal in Winnipeg’s 3-1 setback to Philadelphia on Monday…On Thursday, the Columbus, Ohio native scored again in the Jets’ 4-3 come from behind win over his hometown Blue Jackets…On Saturday, Roslovic recorded his first career hat trick and four-point (3G, 1A) game in Winnipeg’s 9-3 victory over the Anaheim Ducks…Roslovic’s trio of goals were all on the power play, as he was the first Jets/Thrashers player to tally three PPGs in a game since Ilya Kovalachuk did it on Nov. 6/06…Roslovic scored the three goals in 2:20 of power play ice time, which is the third fewest PP TOI to score three or more power play goals since the NHL started to record time on ice…Roslovic led the NHL with five goals this week and was tied for the most points (6)…This is the first time in his career that Roslovic has been selected in the NHL’s Three Stars of the Week…He is the sixth Jets player to be selected in 2018-19 after Winnipeg had eight appearances in the Three Stars of the Week last season…Roslovic joins Mark Scheifele (Dec. 17 – Second Star, Dec. 3 – First Star, and Oct. 29 – Second Star), Patrik Laine (Nov. 26 – First Star) and Blake Wheeler (Nov. 12 – Second Star) as members of the Jets that have earned NHL Three Stars of the Week honours this season. The two meetings between the Jets and Canadiens last season were decided in overtime, with the visiting team winning 5-4 on both occasions. Winnipeg went 4-for-5 on the power play against Montreal last season and are 5-for-12 on the power play in the last four games. The Jets have won back-to-back games in Montreal after going 1-6 in the first seven games at Bell Centre after relocation. Blake Wheeler has scored four of the eight power play goals the Jets have scored against Montreal since relocation. Mark Scheifele leads all active NHL players that have played at least 10 games against Montreal in shooting percentage against the Canadiens at 31.6% (6G, 19Sh). Blake Wheeler leads the Jets in career scoring against Montreal with 18 points (10G, 8A) in 34 games. Patrik Laine has four points (3G, 1A) in three career games against the Canadiens. 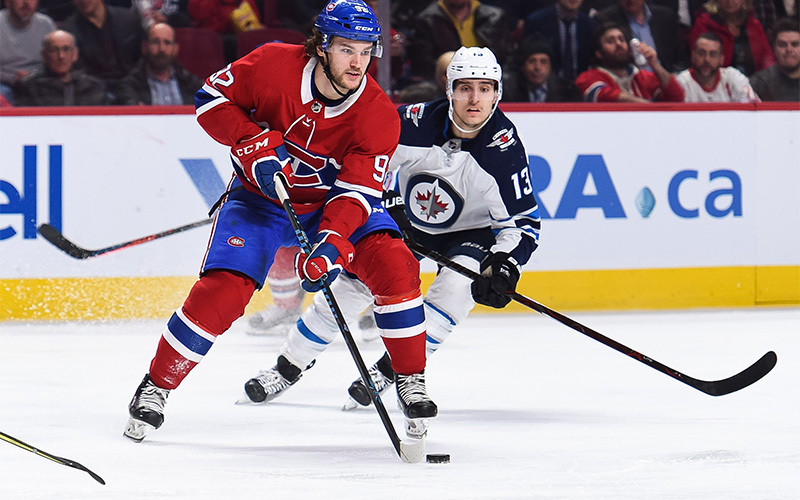 Canadiens forward Joel Armia was traded by the Jets to the Canadiens on June 30/18. He had 58 points (26G, 32A) in 179 games with the Jets from 2015-2018. Jets defenceman Joe Morrow was acquired from Montreal last season on trade deadline day in exchange for a fourth-round selection in the 2018 NHL Draft. Jet Mathieu Perreault is from Drummondville, Que., which is less than 100 km from Montreal along the Trans-Canada Highway. Perreault and Canadiens defenceman Karl Alzner were teammates in the Washington Capitals organization from 2008-2013. Montreal’s Carey Price and Winnipeg’s Bryan Little won World Junior gold together representing Canada in 2007. Canadiens’ goaltending coach Stephane Waite and Jets’ goaltending coach Wade Flaherty were on the coaching staff of the Chicago Blackhawks together from 2008-2011. Jets’ forward Andrew Copp and Canadiens defenceman Jeff Petry are from Ann Arbor, MI. Needs six games played to reach 100 as a member of the Jets.